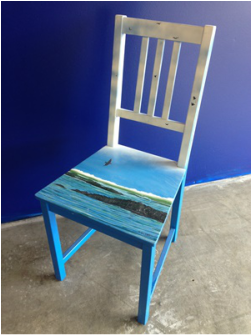 In 2015 Habitat Victoria invited 30 local artists, furniture refinishers & designers to participate in a special event to celebrate the Grand Opening of our second ReStore location at 3311H Oak Street. 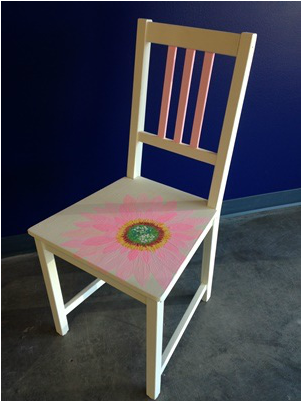 Artists were asked to take a simple wooden chair (provided by Habitat) and paint, transform, upcycle, or revision it. 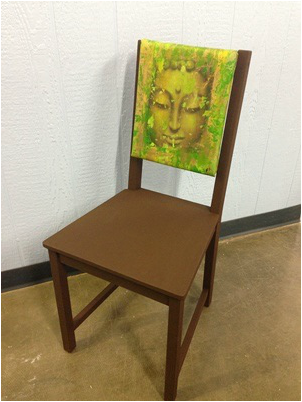 All chairs were auctioned off with 100% of the proceeds towards our current build at 4000 Cedar Hill Cross Road. Habitat Victoria would like to sincerely thank the 30 artists who donated their time and energy to this special fundraising event. An artist who uses the simple yet stunning beauty of nature as inspiration for her work; Alexa Gibbs spends much of her time by the ocean, in the forest and in her very own garden. Mostly self taught, with a few workshops and courses to strengthen her technique, she constantly strives to broaden her artistic knowledge and technical ability. A mind constantly flowing with new ideas, Alexa enjoys knowing that she in bringing the beauty she experiences in nature into people's homes and says that her greatest dream is to one day be known by her art. Hilary has worked with fabric all her life, particularly silk, and showed/sold her "Silken Mosaics" wearable art pieces for years in Vancouver & beyond. (East Side Culture Crawl, Where Vancouver and other media; various commissions & fundraisers.) These days, Hilary's creative focus is on transforming a suburban lot into a garden oasis, (Mother's Day Garden Tour, Gardens West.) where her clients come for counselling/bodywork. 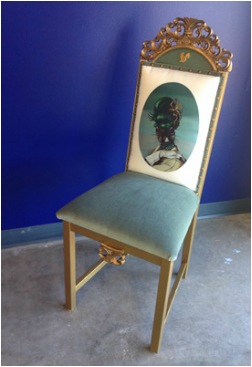 She upholstered the chair with lovely silk chenille brocade and painted with flat chalk paint, adding metallic highlights to echo the subtle colours of the silk. June Haynes was the winner of the City of Victoria Summer Banner Design Competition for 2013/2014. is held in private collections in Canada, the United States and Australia. Communicating through art is very enjoyable." Born in England, Karen Lancey is the award winning welding artist behind Metal Mermaid Welding in Victoria B.C. Her strong design background, esthetic sensibilities, sense of humour, love of nature and the outdoors make for some amazing, one of a kind, and thoughtful pieces. 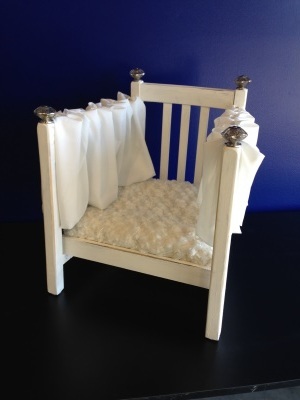 Upcycling is a big part of Karen's work and the challenge is to create the 'perfect piece'. Diane Adolph is an accomplished visual artist based in Victoria, BC. As a successful painter in both realistic and abstracted forms her work has been exhibited and sold locally for many years and is held in private collections worldwide. 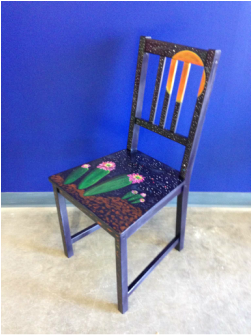 Diane creatively expresses herself through other mediums as well, such as stained glass, mosaics and more recently up-cycling and re-visioning furniture. Using a variety of techniques she transforms the old into new stunning functional home decorative pieces. Under the name “Artful Living Studio” Her pieces can be viewed and purchased at Erica Britt Home decor store located at 901 Esquimalt Road. Rosemary is a maker of handmade ceramic tiles. Bread and Butter Tiles has been the testing ground for translating her environment, so rich with colour, pattern and texture, into the medium of tile.These tiles are used in architectural settings such as kitchens, bathrooms and fireplaces, as well as giftware and tiles for the garden. 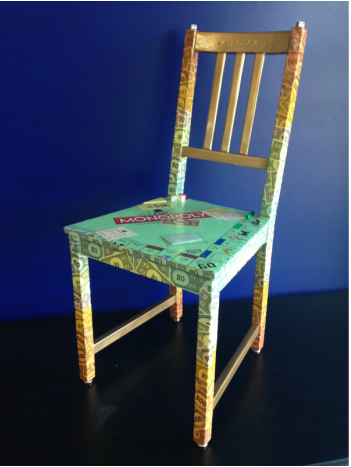 The Habitat for Humanity chair project is a fine way to support a worthy cause and to challenge oneself. Close friends of Rosemary work for Habitat for Humanity Global Village and her husband, Geoff, and his Carpentry students from Camosun College have worked at the 4000 Cedar Hill Cross Road project. Boo has been active as an artist and commercial illustrator in UK and Canada for many years where she has established her own commercial brand and design company MUJKA CHIC. Most of her work is now used in National and International online and offline media, including greeting card and stationery companies, corporate advertisements, and in exclusive commercial collections. Her output has been very diverse ranging from strong graphic style illustration to advertising art, pop art; surface pattern design, textile art and character illustrations.She has been a resident of Victoria, BC since 2011 and exploring venues and ideas to showcase her surface pattern designs in an artistic form. For several years Don and his wife Denise owned and operated the fabled West Coast Wood Designs Gallery in Sidney, where Don became known as "That Wood Guy in Sidney". Don has since returned to his Sidney home studio, where his work is available by appointment. 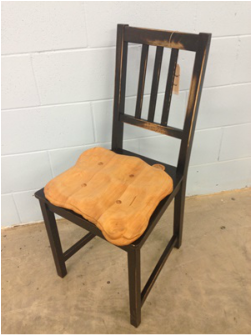 Don also showcases his carvings in Art Galleries, Art Shows, Special Events and local Venues. 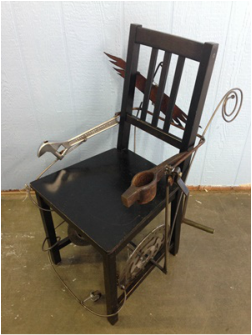 Don's furniture, retails displays, carvings and sculptures have won him several Awards and Accolades. Tracy currently works out of Bat-Fish Studio where she owns & operates “ The Fused Line” working with up-cycled & re-purposed materials finishing with pieces that are polished, unique & creatively stunning, becoming one of kind wearable art. 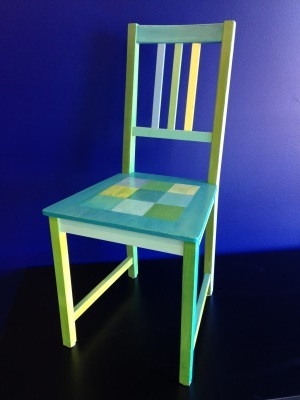 Most recently she has started a group called The League of Extraordinary Designers, working with other designers & artisans that focuses on using up-cycled & re-purposed materials as a starting point in the creative process. 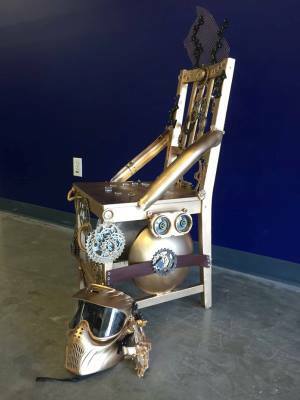 Combining her love of up-cycling & steampunk, the “Time Travel Chair” was created complete with helmet & time wand. I was born in Yorkshire England, immigrated to Canada as a child, lived in Montreal, Toronto, Vancouver and now Victoria and have painted professionally since 1992. As long as I can remember, I have been inspired to create. I returned to the West Coast in 2005 after three decades of study, travel and artistic development. A constant source of delight and artistic stimulus, The West Coast has renewed my energy and vision. Whether perceived on location, from memory or imagination, with every brush stroke I seek to reawaken reverence for this beautiful planet. Colour is my passion, and it inspires me to interpret the beauty and to reveal the magic in everyday reality. I paint in both oil and acrylic on canvas. Dale has a love for all materials and methods of building form. 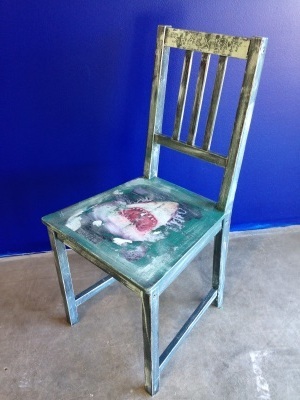 He has been working with found objects, collage and assemblage for over 20 years. Dale has organized and curated the Mailmania Series of Mail Art Shows since 1994, a biennial mail art call open to artists around the world. He has participated in the Moss Street Paint In since 2006, where Mailarta - Queen of Poste (where his performance persona "Dame Mailarta" first appeared). Dale has taught art at various colleges and institutions since 2000. Sharlene is an award winning artist who paints primarily in acrylics and oils, but also ventures into watercolour and printmaking. Light is an integral part of her work, whether to enhance and define the composition of a still life or to capture sunlight in nature. Her series Driftwood paintings and Tropical Leaves paintings are perfect examples. Early in her career Sharlene studied with Alice Saltiel. She has taken workshops with many notable artists including Alan Wylie, Susanne Northcott, Mark Heaine, Catherine Moffat, Noah Layne and Liz Wiltzen. She has also attended courses at Victoria College of Art and Vancouver Island School of Art. Sharlene is an elected member of the Society of Canadian Artists, a signature member and Past President of the Victoria Chapter of the Federation of Canadian Artists and a juried member of the International Guild of Realism. She is also a juried member of the Island Illustrators. She has been an associate artist at the Coast Collective Art Centre since 2009 and one of five directors of the centre from 2010-2013. Raised in Victoria, Carollyne completed two years in the Faculty of Fine Arts, and is a graduate of the University of Victoria, where she completed a double major in Psychology and History in Art. Most recently, she has taken art classes at the Victoria College of Art and studied with The Ryder Studio School in Santa Fe, New Mexico. For over thirteen years she was the founder, co-owner and Creative Director of a technology company specializing in visual communications for websites and custom software interfaces. In September 2010, Carollyne launched her new business as a visual artist, and began to remove the mask of technology to emerge as her true self, standing with her hands on her hips, yelling and laughing at the squirrels in her yard. Carollyne is interested in character development through portraiture. Her work is based on imaginary characters; misfits and alienation. Or perhaps an alien nation. The squirrel face is a metaphor for the secrets we keep. She is represented by Winchester Galleries. Sandra is a Canadian born artist living on Vancouver Island. The name Sapphire has been her nickname since childhood - which is fitting as her art is playful and fully expressed just like a child. For as long as Sandra can remember she has loved creating and being artistic at a very early age. her love for art started in her early teens and has evolved through many different styles and mediums from contemporary to classical art and now to what she calls "energy art"; art that is intuitive and fully expressed in the moment. When Sandra is creating art her main goal is to stay true to the energy that she brings to the piece that day, so really breathing life into each unique piece. Sandra creates one-off original acrylic art works that fit unique styles and spaces. There are no rules to Sandra's art. She is fully expressed and in the moment picking juicy colours and shapes to excite the mind. 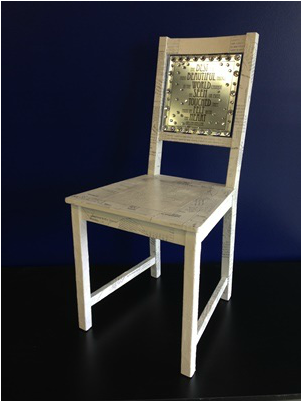 Chair #15 - Jeani Reynolds and "The Poetry of Braille"
Through recent conversations with Aryana Rayne and Linda Bartram of the Victoria Society for Blind Arts & Culture (VSBAC), which advocates for creativity, I was inspired to integrate poetry through written text and Braille for this project. A collaboration of visual and textured language has been collaged using poetry which speaks of the frustrations and pains of the heart, as well as the beauty of realization. 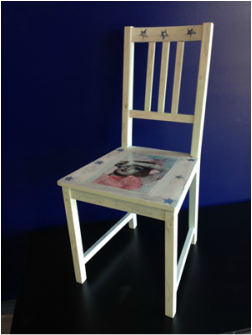 This chair represents the need for creativity to live and flow through both sight and touch alike. Braille kindly provided by Linda Bartram; poets featured: William Wordsworth & Helen Keller. Jeani is an Artist & Designer with 30 years experience working with the theatre and arts community in Victoria. Her coloured past includes being the Artistic Director for the Luminara Lantern Festival, Visual Designer for Victoria’s Olympic Celebration, Fisgard Lighthouse’s 150th Anniversary Celebration; Robert Bateman’s Birthday Celebration at the Atrium and more recently Artistic Director for the Gordon Head Moon Festival and Costume Designer for Enchanted Halloween.Some of Jeani’s artwork and up-cycled designed furniture can be viewed and purchased under the name “Artful Living Studio” at Erica Britt Home decor store located at 901 Esquimalt Road. Joanna has been making art of one kind or another almost all her life. She has explored printmaking, ceramics, papier maché, drawing, design and watercolours. She studied art at Vancouver School of Art and at UBC, and has taught art to children and adults. Joanna has taken workshops at MISA and has participated in a number of group shows in Victoria. Most recently she has been investigating abstraction with acrylics and is a member of the Wednesday Art Group mentored by Bill Porteous. 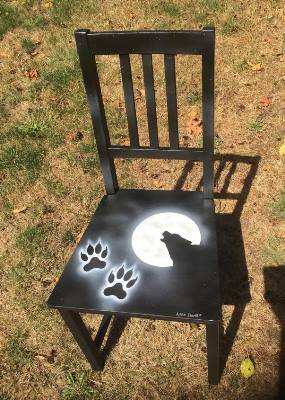 The chair project has been a lot of fun for her. Erika Simonsen is an Interior Designer with a love for all things furniture decor and design. Throughout her early years in Victoria, Erika was forever exploring unique furniture configurations; continually transforming her space in the family home. She loved surrounding herself with new pieces and personal touches. Launching her career in Commercial Design, she relocated to Vancouver in 2004 as Store Design Manager for Lululemon Athletica Ltd. After successfully completing construction designs for more than 35 Lululemon stores throughout North America, she has now chosen to return to Victoria to begin a new design venture, closer to family and friends. Erika has refocused her talents on interior design consulting, furniture revival and ‘treasure hunting’ for the shop. Erika Britt Home is a funky furniture store with an eclectic mix of new and revived pieces, antiques and unique décor items. Refurbished solid wood furniture brought to life with a fresh coat of paint and a designer’s touch. Finding great furniture great homes. From a gonzo path less traveled, Bruce draws from his bizarre experiences and his social conscience of convenience when creating his photographs, paintings, and writings. A photojournalist and raconteur armed with tales from his travels; from backhands to bars; from beaches to vineyards; from university to social work – caring for societies discarded children while conquering the seas, trees, and slopes of North America; battling poverty and disability while desperately clinging to parenting. Through it all, Bruce Dean has been producing his modestly awarded, frequently galleried, and randomly published - humor, photographs, paintings, and writings. Bruce has studied at Victoria College of Art, Vancouver and Santa Barbara City Colleges, and the University of Alberta. Dean holds a diploma in Photojournalism from Western Academy of Photography, and a Bachelor of Fine Arts degree from the University of Victoria. Bruce Dean’s writings, photographs, and paintings primarily focus upon real life struggles and inexplicable injustices; his widely recognized art is often an intentional moderately-offensive and mildly-controversial social exposé utilizing photography and/or paint. At ReLoving in Victoria, BC, we sell furniture we have revived and reloved as well as products and classes to help you to do your own re-styling. 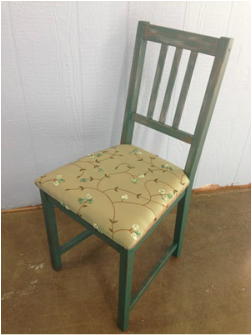 We take great pride in customizing furniture you buy at ReLoving or bring to us from your thrift store finds or grandma’s closet. Using tools and techniques based on the Country Chic chalk & mineral based paint products, Fusion and Milk Paints, we strive to create interesting finishes on eclectic pieces that give quality vintage furniture a unique and often stunning personality. Sharing special pieces with you – and sharing the skills and techniques we have learned along the way – is what makes ReLoving so rewarding. We are located at 101-751 Goldstream Avenue (at the back right of the Plaza, facing Bryn Maur Rd. ), Victoria, BC. I have recently retired from my teaching career where I shared my love of art with many classes of children. I also taught art classes to teachers during conferences. 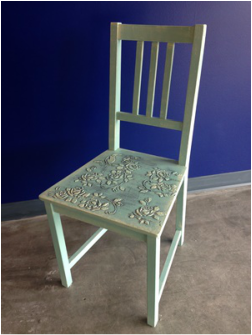 I am now restoring and painting vintage furniture and have a business called "The Turquoise Verandah". 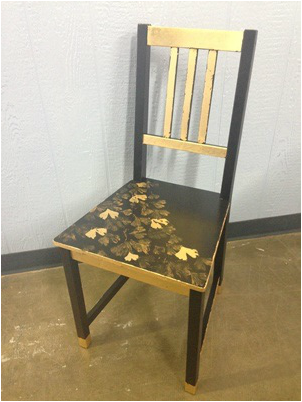 This chair is painted in chalk paint and accented with gold leaf and printed in metallic paint using gingko leaves. Creole Carmichael is a local jewellery designer and goldsmith who has been creating custom jewellery since 1991. Her passion for art began at a very young age. As a child she won several awards for her art. Her passion for three dimensional arts began at the age of eleven when with one of her creation of a tribal mask in paper mâché won artist of the year for her school. The previous year she also won artist of the year for a portrait sketch she had done of one of her friends. Her passion for art and creating objects has lasted a lifetime and she is a truly creative person. Her backpack has taken her to many countries that have inspired her jewellery creations and art. Her art and jewellery reflect her love of nature and are mostly organic in nature. In addition to her fine jewellery creations in precious metals and gemstones she also paints in watercolors and oils. Sara has been painting her entire life using mainly water colours and acrylics. 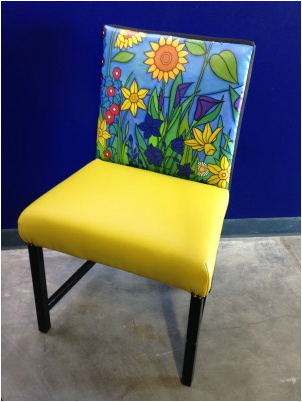 She has painted various murals, but this was her first chair project. Sara has worked at Habitat Victoria for the past two years as the Office Administrator and Homeownership Coordinator. She loves her job and it was a special bonus to tie her love of art into a project for Habitat Victoria! It has been a fabulous experience working with all these local artists and seeing the fantastic creations they come up with. 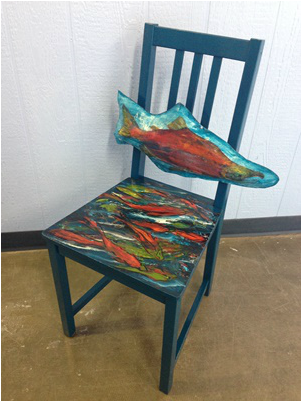 Kelly is a self-taught Comox Valley Artist who has made it her mission to transform spaces through Art. 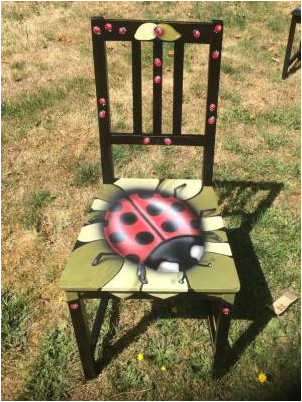 Her diverse styles and mediums range from Airbrushing to Tromp L'oile, Sand-Blasted Glass Etching to Chalk Art, Window Painting to Custom Signs, Logo development and Business Branding, set design and painting, and much more. Kelly's work graces many homes and businesses from Vancouver Island through to the Okanagan and beyond. The Hospital Murals and most of the School Murals and Logos throughout the Comox Valley were created and executed by Kelly. She is helping the next generation to explore their own Artistic talents by encouraging them to express themselves through Art by teaching private lessons and special seminars in Schools. 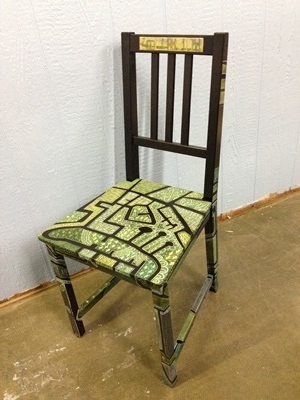 Her chair is the latest of many projects undertaken for Habitat for Humanity. 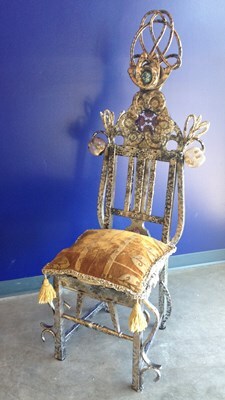 For a closer look at Kelly's many creations visit her website.... and follow the FaceBook link. Ashlie is a budding young artist who is following in her mother's footsteps. Mentored by her Mom, Kelly, Ashlie is developing her own unique style, perfecting her techniques in airbrushed wearable art and mural painting, just a few of the projects she's undertaking!! Ashlie is expressing her creative talents as she explores the exciting world of art in its many forms. Watch for more from this talented young Artist. 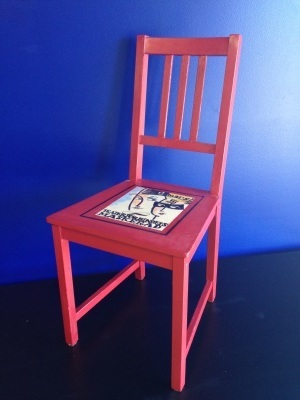 Daryll has built a career in the arts and the sign industry for the last 30 years. Since 2011, he has blended both facets together when he created Iteam Signs, a shop that has given new meaning to the visual expression. merging the boundaries of dimensional art with signs has given his clients an attraction to their businesses without relying solely on "letters". Building a landmark for people to remember them. 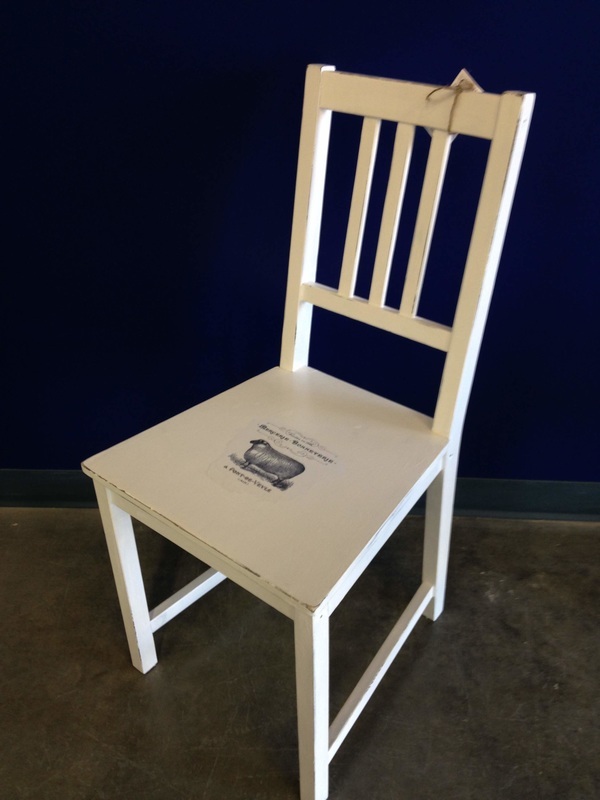 This chair is a nautical inspired creation, for a company that has become a landmark of hope, for an everyday workload of need in our communities. Darryl hicks and Iteam Signs is honoured to be a part of this. Arthur has been a theatre designer (sets and costumes) working across the country from Halifax to Victoria. He retired in 2007 when he and his wife, Barbara, moved from Ottawa to the west coast. He has designed many shows for organizations such as Neptune Theatre (Halifax), The Stratford Shakespearean Festival, The National Arts Centre (Ottawa), Abbey Theatre (Dublin), The Manitoba Theatre Centre (Winnipeg) and many others. Habitat for Humanity has always been a favourite charity and he is happy to make a contribution to its cause. Christi was raised in Montreal and came to the island twenty-five years ago and fell in love with it. She received a bachelor of fine arts from the University of Victoria and went away from the island to teach and work overseas, but always returns to her beloved mother, this piece of earth she has adopted as her home. She loves to experiment with different mediums and has recently been playing with mixed-media collage in miniature format. These have recently been shown at the TD Art Gallery Paint-In and her cards are sold on Etsy. The materials Christi finds on her many walkabouts is where she starts to see form, shape and ideas come to mind. The collages were born from a need to start with a found image and take the story from there and play with the possibilities. Themes of romance, melancholia and history are steeped in with a mélange of magical sprinkles of stardust and glitter. Images appear from a gallery somewhere in her mind. …is proud to be raising three children and managing a house-full of family and guests here in Victoria. 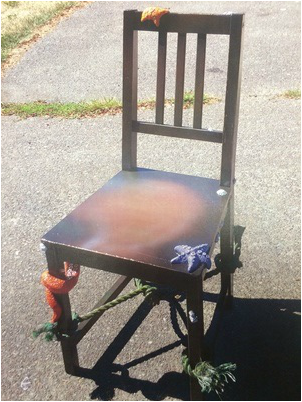 Jess created her chair with a friendly Tim Burton in mind. 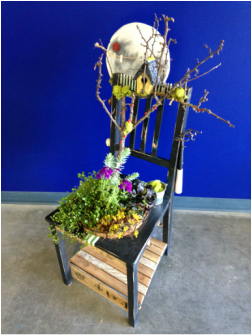 Put it on your patio, garden or anywhere in your home, this creative planter chair will make you smile. …is a family man delighted to be working with is partner Jesika in this creative new endeavor. 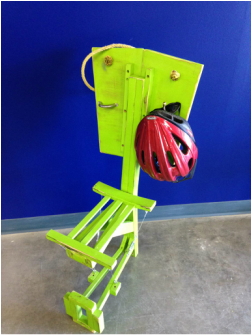 Mike was inspired to dismantle the Habitat chair entirely and repurpose it as a one-of-a-kind bike rack. Hang this beauty up to get the greatest impact and effect! Ruth is an accomplished textile artist and graphic designer. 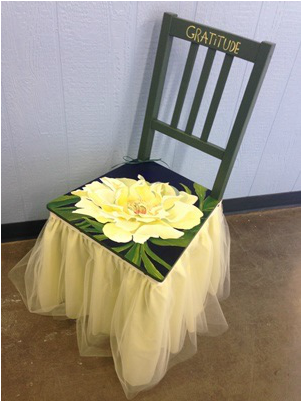 She has been working with a wide range of media and fabrics to create one of a kind pieces of wearable and usable art and furniture for close to 30 years. She has mastered the ART of upholstery as well as teaching it. Ruth enjoys the process of re-imagining and re-designing furniture, interior spaces and anything that needs a new life. She also provides art reproduction services directly to other artists on a variety of mediums. With an eye for the details and as a colour specialist, it is no surprise to see the combinations of art and function come together in her work. Keeping with the spirit of the RE-STORE - this piece for Habitat made use of a recycled canvas of "Natures Grace" - provided with permission from another fantastic artist - Bernadette McCormack of Duncan whose work is available at bernadettemccormack.com. 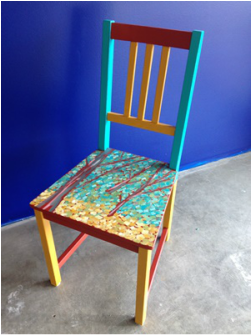 The chair was widened for a little more "presence" with recycled hardwood, plywood and a scrap of vinyl left over from another project. Ruth is available to assist you with your vision and projects through Christal Custom Upholstery in Oak Bay and online via christalupholstery.com and will soon be available as well for classes and consultation through Studio1867.com.